Our eleventh and twelfth-grade AP Language students journey to Fell's Point to learn more about the life and times of Frederick Douglass. This year marks the two hundredth birthday of a Baltimore icon: Frederick Douglass, the former Maryland slave who, after his escape, devoted his life to the abolitionist cause. In commemoration of his legacy, eleventh and twelfth-grade A.P. Language students read his famous first autobiography, "Narrative of the Life of Frederick Douglass," and then journeyed to Fell's Point to learn more about his life. Douglass spent some of his formative years working as a house slave for the Auld family on Fell's Point. It was here that he learned to read, by employing clever strategies like coaxing lessons from street urchins in exchange for bread. In his first narrative, Douglass identified these years as a particularly important period in his life, a period that ignited his desire for knowledge, which would ultimately result in his escape from slavery. 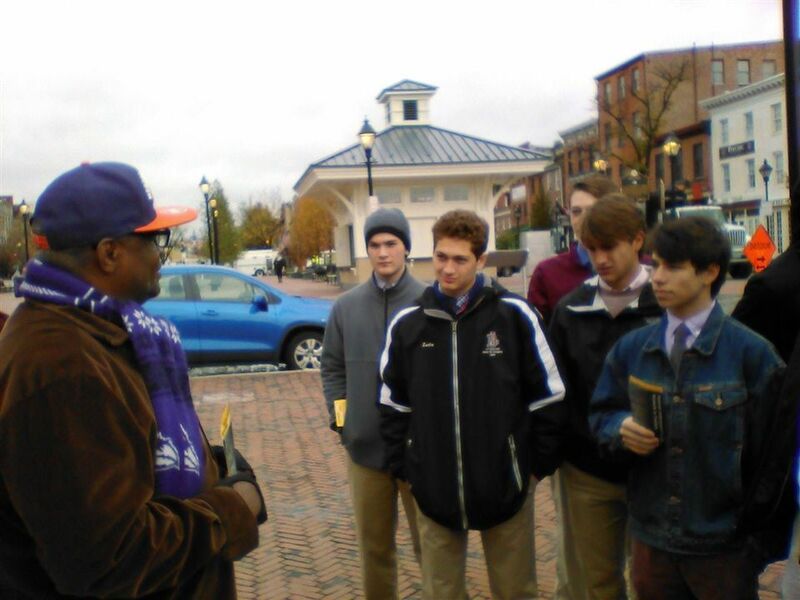 Led by Mr. Barron and Mr. Freihofer, the group of twenty-four students joined the "Path to Freedom" walking tour, led by local historian Lou Fields. The tour included stops at the site of the house where Douglass once lived, the dock where he once worked, as well as the maritime museum that now bears his name. His classmate Andrew Grover '19 agreed: "This tour really put Douglass' world into perspective, as we walked through the streets of Fell's Point."